This project is originally written by Simon Werner Simon, won Second Prize in The SeeedStudio BeagleBone Green IoT Contest in hackster.io. This boat is going to compete in the World Robotic Sailing Championships in Portugal. Read here for more information. This article describes how to get the BeagleBone Green working as a remotely controlled device that can send back status updates (position and attitude) to the controller. See the video below for the awesome demo. It shows the device connected to a sailboat, but you could connect it to anything. I will describe how to get each component working individually, including the complete code to see in the video demo. All the code is open sourced so you can contribute back to it. Note: it works for the BeagleBone Black too. Heck, a lot of these instructions will also work on the Raspberry Pi too, but your mileage may vary and I can't support you for that. Below is an example of the orientation (attitude) of the final device. It uses the Madgwick algorithm to smooth out the noise. Although I have written a library for this, I have not included it in the tutorial. Orientation of the device (uses Accelerometer, Gyroscrope and Compass). Below are the steps I will take you through. Prerequisites - what you need to know before undertaking the tutorial. Compass - how to get the compass working. Gyroscope - how to get the gyroscope working. Accelerometer - how to get the accelerometer working and it's limitations. GPS Receiver - this is a serial device, how to get this going. GPRS Modem - how to get this going using pppd to connect us to the Internet. Servos - how to control the servos. Power Source - attaching a power source to make it truly remote. Remote Control - in the last step we will communicate with it. This section describes what you need to know before you begin building. I have built my device onto of some perspex, you can do the same or use another method (e.g. 3d printer). I don't go into the detail of the perspex sheet. The BeagleBone Green or BeagleBone Black: Essentially they are the same, with some minor differences. For this project I recommend the Green since the Green has Grove connectors which much things much tidier. Read up about the BeagleBone. The forums are a great place for support. Linux: The BeagleBone series run Debian GNU/Linux. You will need basic command line fu, but I will try to avoid it whenever possible. Here is a basic tutorial. Note: from Cloud9 you can open the Linux terminal (command line) by pressing the [ALT]+[T] keys together. Linux Editor: Cloud9 is great for coding, but it does not allow you to edit system files (probably a good thing). So you should become familiar with a text editor, I suggest nano, it does not have a steep learning curve. Although I typically use mcedit or vim. Drill for drilling the screw holes in the perspex (not described). I use small Torx screws which were scavenged from hold computer hardware. Tape / glue - for fixing the GPS antenna. Saw and file cutting and finishing the perspex. 4GB micro SD card for loading the new version of Debian. Activated SIM card for the GPRS Modem. SIM card size is standard sized. Power source for wireless operation - I use a USB power bank. The BeagleBone Green currently comes with Debian 7.8 by default. However, these instructions require Debian 8.1 or above, I tested them on Debian 8.3. The reason is that Debian 8.3 has Linux kernel 4.1.x, which has more stable cape manager for the BeagleBone. Octalbonescript will also only work with this version, or above. Download the latest Debian image from https://beagleboard.org/latest-images. Install this on the 4GB micro SD card (instructions are here). All you need to do is insert the SD card into the BeagleBone Green and it will boot with Debian 8.3. All changes you make will be saved to the SD card. Once you have booted the BeagleBone, you should update the software and operating system. Use Cloud9 IDE on your BeagleBone (http://192.168.7.2:3000 if you have your USB connected), ssh or PuTTY (in Windows) to access the BeagleBone. After upgrading you should also reboot. You can press the RESET button the BeagleBone Green. then save the file and reboot. What this does is load the capes we require for this project. Some things to keep in mind for the layout. The accelerometer, compass and gyroscope all have an X-Y-Z graphic printed on the circuit board, see picture. You should align these together such that the board for each is in the same direction. The accelerometer and gyroscope integrated circuits should be physically close to each other, this ensures when we put all the data together we take the information from one point. It's best to plan a bit first, I suggest for each component, decide which pin it is going to occupy. I put this into a spreadsheet. Below is my plan along with the BeagleBone pins. Plan your pin usage. This diagram shows the pin I have used for this project. The Grove 3-Axis Digital Accelerometer(±1.5g) has 3 orthogonal accelerometers. An accelerometer can measure gravity as well as acceleration/movement in a direction. Accelerometers are generally very noisy devices, I have seen this accelerometer fluctuate ±5 degrees when lying still. They also have a low resolution, meaning that smallest angle of resolution is 2.7 degrees from vertical. However, this is a know issue with accelerometers in general and when you pair them with a compass and gyroscope as well has use noise filtering you can reduce this issue. This accelerometer measure a g-force up-to 1.5g, which is good for general use and swaying, but not good if you want accurate tap or knock detection. For that you need a larger range accelerometer, like this one. First connect your accelerometer to your BeagleBone Green, see photo below. The BeagleBone i2c Grove connector is connected to the i2c-2 bus. 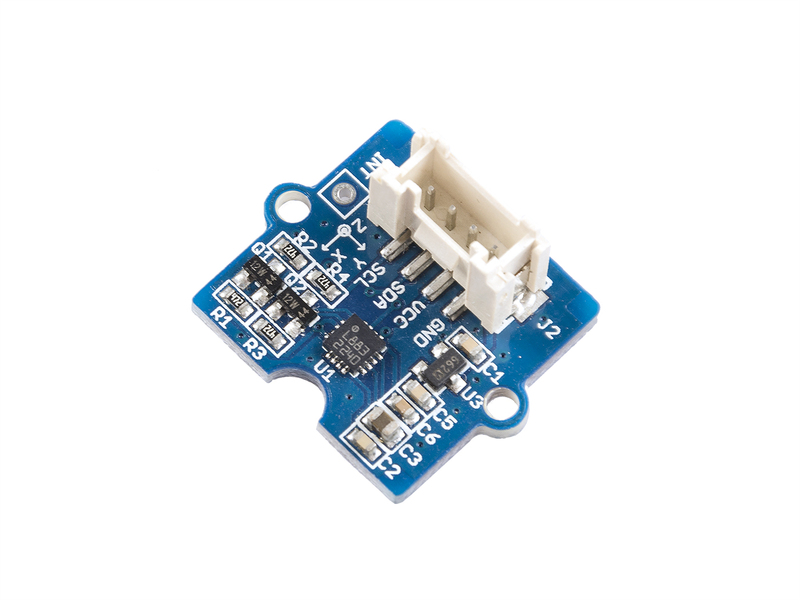 Accelerometer connected to the on-board i2c Grove connector. Communication is over the i2c bus, the Grove connectors make it seamless to connect to the BeagleBone Green. 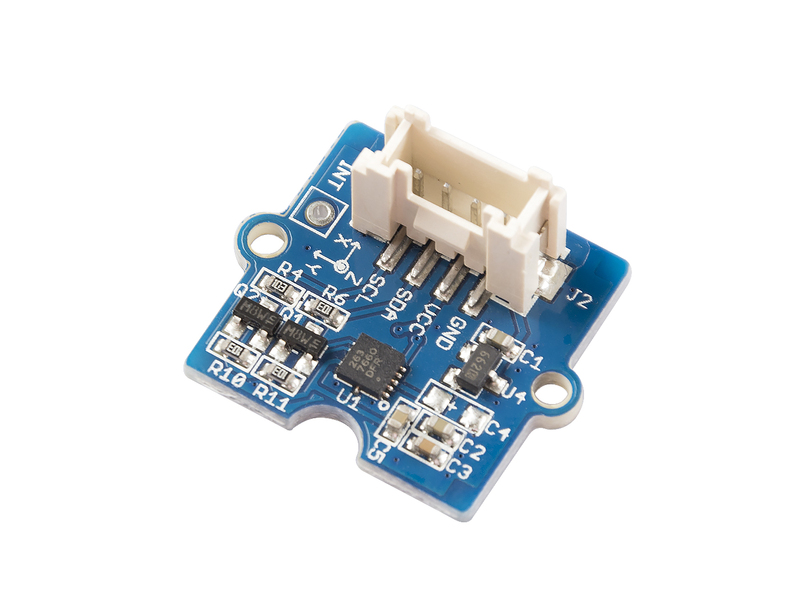 This accelerometer contains a Freescale Semiconductor MMA7660FC chip. This will take a minute to download and install the accelerometer-mma7660fc library. It will create the node_modules folder (if not already there) and place the new library into that folder. In Cloud9 click run (see green play icon) or use [ALT]+[F5]. This will run the code, it may take a few seconds to start. You should see a similar output as the following. The Grove 3-Axis Digital Compass has 3 orthogonal magnetometers and can detect the Earth's magnetic field. Communication with this device is over the i2c bus. This compass contains a Honeywell HMC5883L chip. Let's continue to build on top of the accelerometer and add the Grove Cape for BeagleBone Series and compass. You do not need the Grove Cape, but you can simply use the Grove i2c hub, it's a simpler and more elegant solution. Push in the Grove Cape, this can take some force - but don't apply too much. Connect the compass to i2c-1 port of the Grove Cape. See photo below. The compass (second from left) connected to the Grove Cape (i2c-1) connector. This will take a minute to download and install the compass-hmc5883l library. Run your code, you should see a similar output as the following. The values should change as you rotate the compass around the z-axis. Next up we add the Grove 3-Axis Digital Gyroscope, it has 3 orthogonal gyroscopes. A gyroscope (gyro) measures rotational acceleration. So when the device is at rest, all gyros will report values around zero. This SparkFun gyro contains a InvenSense ITG-3200 chip. Again, like the accelerometer gyros are generally noisy, so you will see the values fluctuate. Connect the gyro to i2c-2 port of the Grove Cape. See photo below. The gyro (front left) connected to the remaining i2c (i2c-2) Grove Cape connector. The output should look like something below. You also notice the"temp"value which is the temperature in degrees, however it is currently returning incorrect values due to a bug in the code - which has since been fixed. Next up: Grove GPS. 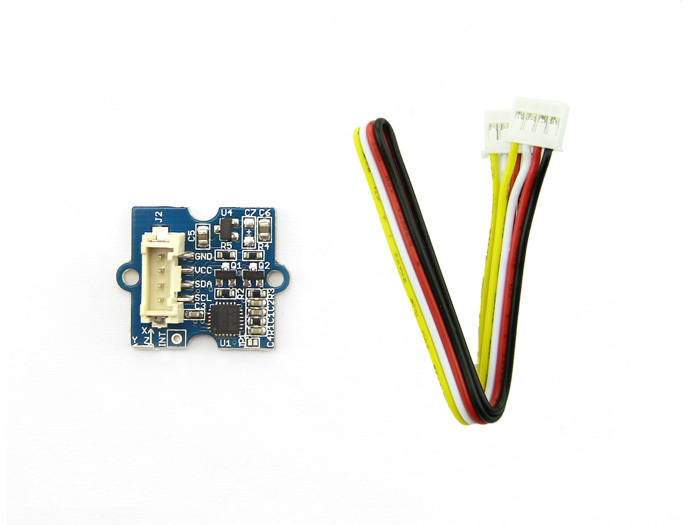 A simple GPS receiver with an aerial. I have found this device to be reliable (compared to another brand I tried) and reasonably quick at picking up GPS signals. Connect the GPS to UART1 (J2) on the Grove Cape, see the photo below. To secure the aerial I just used tape (unlike in photo). You should see a the green PWR light come on. On BeagleBone Linux UART1 relates to the device driver /dev/ttyO1. The GPS (front, second from left) is connected to UART1 on the Grove Cape. Unlike the previous devices, this one does not use i2c, it uses the serial bus (UART). Since most GPS devices communicate over serial and speak NMEA (a GPS protocol), most GPS devices can use the same driver. However, I found the packages on npm did not suit my requirements so I created my own, it's called super-duper-serial-gps-system. debugger listening onport15454enabled serial: /dev/ttyO1NoGPSsignal.NoGPSsignal.NoGPSsignal.NoGPSsignal.NoGPSsignal. Next we connect the GPRS Modem, this allows you to use your local GSM (2G) cellular network to connect to the Internet, once you are wirelessly connected to the Internet anything is possible! You could also connect to the Internet using a USB WiFi dongle, but these use more power than and will drain your battery if you are going to be truly wireless. GPRS Step 1: Connect the hardware. GPRS Step 2: Configure the GPRS module for faster Internet. GPRS Step 3: Configure the Internet connection using pppd. GPRS Step 4: Connect to the Internet. So I am using the GSM2 Click with a GSM antenna (MIKROE-275) on top of the MikroBus Cape. This device has the Quectel M95 FA GSM/GPRS module. Before you purchase it, make sure your cellular network provider supports the listed 2G frequencies. This device uses the serial port for communications, we will use UART2. The GSM2 Click comes with the pins unsoldered, you need solder these on - see section 2 of the GSM2 Click user manual for instructions. Insert the activated SIM card (standard size) into the SIM card slot and lock the slot. Attach the GSM aerial. Insert the GPRS modem onto slot 1 of the MikroBus Cape. And finally push the MikroBus Cape firmly on top of the Grove Cape. When powered on, you should see the yellow STAT light on and the red NET light flash. The Quectel M95 module has a lot of features. One of the features is that the M95 module should automatically detect the communication speed (baud rate - you can think of it as bits per second or bps) of the serial line. However, I found this is not the case - at least not for me. So we need manually set this and save it to the firmware. By default it behaves well at 9600 baud, but if you want faster Internet speeds then you will need to increase this value. The maximum speed is 115200 BAUD. If 9600 baud is good enough for you, then you can skip this section. We need to install minicom to manually communicate over the serial line, configure the M95 and save the settings such that they are not lost on boot. Now in the console type AT and hit the enter key. You should get an OK as the response, see image below. Congratulations! You are talking to the M95 GPRS modem. The minicom console with AT and OK.
All modems have a series of AT commands, these AT commands tell the modem what to do, they typically give you a response. The M95 AT commands are well documented on the Quectel M95 product page, under downloads see the"Quectel_M95_AT_Commands_Manual_V3.2.pdf"document, a login is required but registration is free. and the response is probably not shown or garbled. This because the speed of the UART2 communication has changed and minicom is still expecting 9600 baud. To exit minicom: type [CTRL]+[A], [Z], [X]. and check all is working again by typing in AT, you should get OK as a response. There are numerous other AT commands, these allow you to interact with the modem and determine things like the cellular signal strength, send/receive SMS, handle voice calls, etc. I won't discuss these here. To make our device really awesome, it needs to connect to the Internet remotely. We have the hardware and configured the modem, but now we need the software to drive the modem and make an Internet connection. 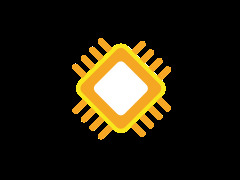 We will use the Point-To-Point Protocol (ppp) to make a connection to Internet, we will install pppd, configure it and run it. 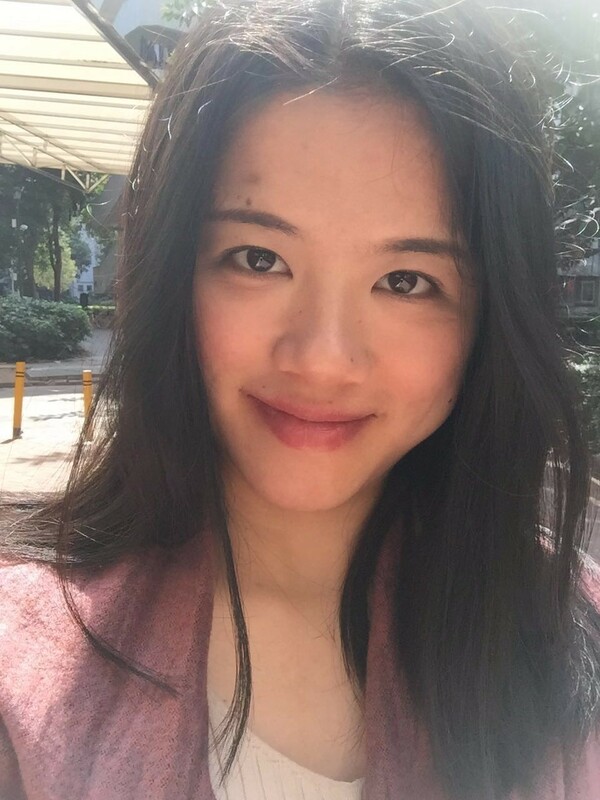 pppd is highly configurable and will handle cellular network authentication, re-connection in case of a lost connection, etc. TIMEOUT60ABORTBUSYABORTVOICEABORT"ERROR"ABORT"NO CARRIER"ABORT"NO DIALTONE"ABORT"NO DIAL TONE"""ATZOKAT+CGDCONT=1,"IP","internet","0.0.0.0",0,0OK ATDT\TCONNECT""
IMPORTANT: the line with AT+CGDCONT contains the APN (access point name)(or"WAP connection string") which is specific for your cellular network provider. You may need to change the"internet"string. Note: The above file is my actual provider file. Your provider may require different values, read the comments for an explanation. Note: The /var/log/messages file is a log for all system activity, so you may see additional logs not related to pppd or chat. Off: The module is not running. Flash every 800ms: Not connected with network. Flash every 2000ms: Connecting to the network. Flash every 600ms: Connected to network. In this section I will describe how to connect one servo and get it running. Getting more servos running is just as simple, you just need spare PWM GPIOs. Servos use Pulse Width Module (PWM) to determine the angle at which it should be set to. Again we use octalbonescript to set the servo angles. I use a Futaba S3003 analogue servo. It can use 3.3V or 5V as the driving voltage, this can be driven by an external battery. The control line (white) is connected a BeagleBone PWM GPIO. I use P9_16 for one servo and P8_19 for the other (later in the documentation). Below is a video showing the connected servo in action. Video showing the servo in operation. The final part to make your device truly wireless is a power source. The BeagleBone Green has 5V battery terminal pins (TP5-TP8) and there are a few places which document how to use these (Element14, RaspBX). There is also a battery cape. But, I used the simplest option and that was to use a USB power bank (portable USB charger). This allows you to directly power the BeagleBone through the micro USB port. This works for this project. However, if you are using different components or your servos are using a lot of power you may want to look at the alternate options. This would be using a 5V power source attached to the battery pins (TP5-TP8) and/or powering your servos from a different source. In the steps above we have built all the necessary hardware and connected to the Internet. In this step we will set-up a solution to remotely control the servos and allow the device to send us status updates. This is the last step necessary to have a fully functional device. First I will explain the technology required to do this, then I will explain how to implement it. Controller: This is a smart phone or tablet, when you tilt the Controller it will send commands to the the Controlled Device via the Proxy. Controlled Device: This is our device we built, it connects to the Proxy and waits for commands from the Controller, while also sending status updates to the Controller. Proxy: This forwards commands from the Controller to the Controlled Device, and vice-versa for status updates. The Proxy also creates a web-server that serves content, the Controller is just a simple web-page served by the Proxy. An overview of the remote control solution. Why can't we communicate directly between Controller and Controlled Device?We could if we were on the same internal network. But once you are remotely controlling devices over a GSM/Cellular network it is generally not possible to directly communicate with a device. For instance, you can't directly access your phone's IP address over the internet, there are a few reasons, one is security. I have created an open source project, web-remote-control, that addresses this issue. It uses a lean communication protocol (based on UDP) to control the BeagleBone remotely. First we will set up the Proxy server. If either the Controller or the Controlled Device is connecting over the cellular network then you need to setup a publicly accessible Proxy server (i.e. in the cloud), otherwise you can setup the server on your own PC, or even on the BeagleBone itself. For cloud servers I use AWS, but I recommend Heroku since it's learning curve is less steep. Both come with free tiers so you should not have to pay for this. Note: you need to make sure UDP port 33330 and TCP ports 8888, 33330 and 33331 are open. Your proxy and web-server is up! Where you need to enter the domain name or IP address of your server. This link on your tablet or mobile phone is your controller. Now you will be able to go to the controller and control your device. Reboot and your device should connect to the Proxy. Great, if you've made it this far you have all the knowledge to put this together into one lean mean superhero. 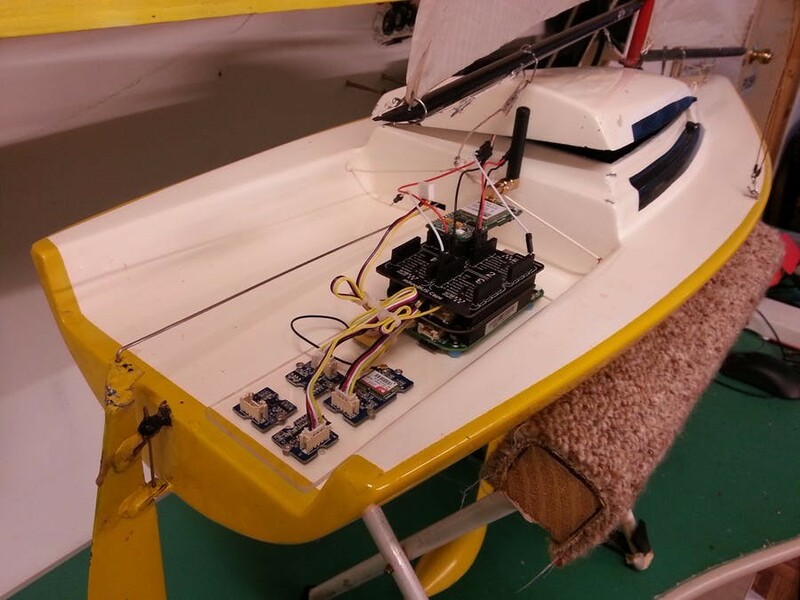 As in the demonstration video I have applied Remote Controlled BeagleBone device to a sail boat. But the other applications are endless. I will be progressing the sailboat further. Follow the action on anemoi.nz. The idea is to create a fully autonomous sailboat, let me know if you are interested in contributing to the project which will be open source. Let me know in the comments about your thoughts. If you have any questions I will be glad to answer them.